August week 4 – Water, Living Water! In some parts of the country people would love to be playing in the fountains because it is scorching and other places dried up fountains would be preferred to those six feet under water. For the peoples of these places we wish health and healing, relief and restoration. 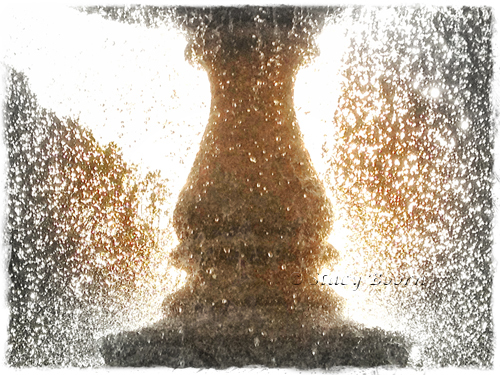 Nonetheless, this past week I was drawn to the sparkling spray of a particular fountain in Sausalito which dazzled in the early morning light. Capturing the feeling of being in its sprinkling relief and restoration was my photographic challenge. No matter what you think, photography also is political! Our images convey some specific messages: environmental care, hope for the poor, the spirit of the athlete, etc…. Even abstract and creative images have a message, although not always obvious or offering single points. Water, living water – no matter how low I got below this fountain I could not exclude the trees and some of the buildings across the street. So I chose carefully how to use them. With the image that included the buildings I used an “old time image” post processing software. In the other images I boosted the saturation a little (you can do this in camera or post-processing). But the most important ingredient was the sun and its low angle in the morning sky. That also accounts for the golden look of the otherwise dull grey cement of the fountain. The elephant sculptures and fountain were designed by Sausalito architect William Faville for the 1915 Panama Pacific Exposition and then donated to Sausalito in 1916. 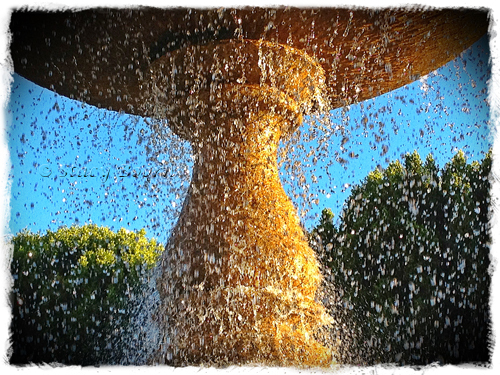 The fountain is in the Plaza Viña del Mar. Viña del Mar translates to “Vineyard of the Sea,” and is a Chilean city on the coast in the Province of Valparaiso which is also Sausalito’s sister city. 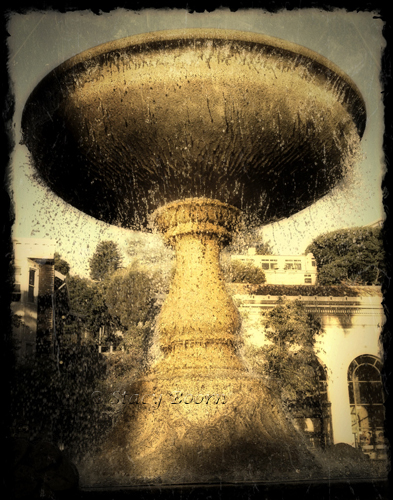 This entry was posted in Weekly 2 and tagged Photographing Fountains, Plaza VinaDel Mar, Sausalito, Water, Water Images. Bookmark the permalink.